Camagüey, located in east-central Cuba, is the island country’s third largest city, about five hours’ drive (one hour by plane) west of Havana. Yet few people have heard of it, and when it comes to dance, it has been overshadowed by the Cuban capital’s rich well of accomplished companies, from the classical to the contemporary that have visited our shores. After the sublime one-night only performance by Ballet Contemporáneo de Camagüey (March 13), that is about to change, thanks to native son Pedro Ruiz. Ruiz, who had a celebrated 21-year career with Ballet Hispánico as principal dancer and choreographer, returned home in 2010, after a 30-year absence. In 2013, he began his association with the Ballet Contemporáneo de Camagüey and was named its artistic director two years later. With its U.S. debut, Ruiz realized his dream of bringing the Company here, not only to perform, but also for a week-long cultural exchange, organized by Hunter College, billed “Cuba Aqui,” that included the ten Company members (five men, five women) taking classes in various dance techniques with prominent teachers and attending a performance of the Hubbard Street Dance Company. 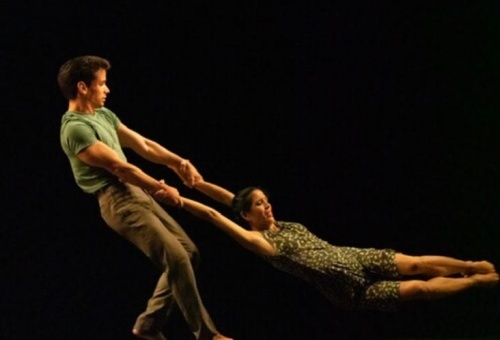 Ruiz, who hails from Santa Clara, about halfway between Havana and Camagüey, is now bi-country, as Artist-in-Residence at Hunter as well as on the dance faculties of Marymount College, The Ailey School and Pace University. “Guajira” opened with a visually impressive silhouette of the dancers’ arms fashioned into birdlike wings, their bodies folded under. The dancers executed movements with varied fast-paced lifts and releases. The women in the Company all seemed to have very long legs, which they extended straight up to the rafters. The second section was slower and featured precision flying lifts, holds and baskets. In “Lavanderas” (laundresses), three women washed and folded a white sheet from a basket, scrubbed the floor, and worked their hips and pelvises to an African beat. For the romance section, Siuchién Avila and Fernando García Lezcano performed a finely attuned contemporary duet to slow music. For the rousing Company finale, the music was rhythmically faster than the choreography, which made for an interesting counterpoint. “Más Alla Del Mar” (Beyond the Sea) is a quirky piece for its subject matter. It is inspired by the Italian island of Sardinia, where Ruiz had performed in the past. Ruiz said it reminded him of his own island country, whose expressive people have been shaped by the sea, the elements and its folklore traditions. It featured traditional Sardinian folk songs sung by Sardinian soprano Elena Ledda. The small round sparkly lights overhead, I think, reflected the pristine star-studded nights. The performers wore white pants/skirts and green tops, two of the colors of the Italian flag. The dances were lively, with one especially rapid section named “Tarantella” based on the whirling southern Italian folk dance. There were also three outstanding duets. The finale was “Paseando Mi Alma” (Taking My Soul for a Walk), with music by Cuban-American Dafnis Prieto, 2019 Grammy Award winner for Best Latin Jazz Album (“Back to the Sunset”). This was the most dazzling, smoking hot piece with jazz elements, slow and sultry sections and explosions of youthful energy and passion. 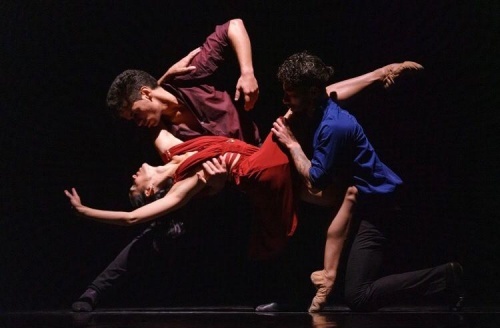 It showcased the Company at its finest, whether dancing as a cohesive ensemble or in two amazing trios, in which Leandro Antonio Leguen Pulsan, the dancer with the longest name and hair figured prominently. Camagüey, you have arrived. Siuchien Avila partnered by Marco Delgado (in blue shirt) in "Paseando Mi Alma". Siuchien Avila & Fernando Garcia Lezcano from "Mas Alla Del Mar".